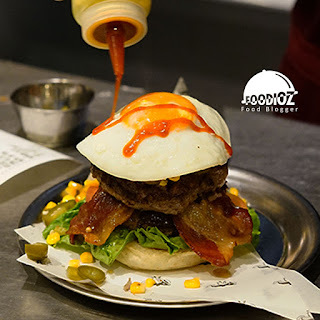 Recently, one restaurant that has been quite a hits in social media, with a pretty interesting name, a unique concept and of course with a tempting menu that is burger. 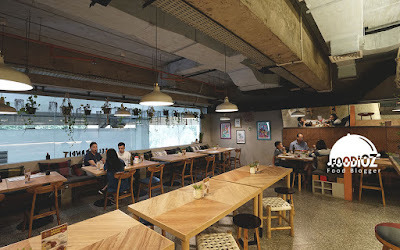 Belly Bandit is located in Noble House Building which is an office building in Kuningan area, Jakarta. After the parking, we just need to pass the lobby area and go up one floor. From a distance already looks Belly Bandit plank that is eye catching with a wolf card logo that looks fun. 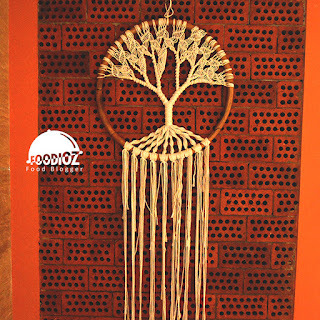 Just as with the concept of modern, trendy, bright colors dominate the whole restaurant. 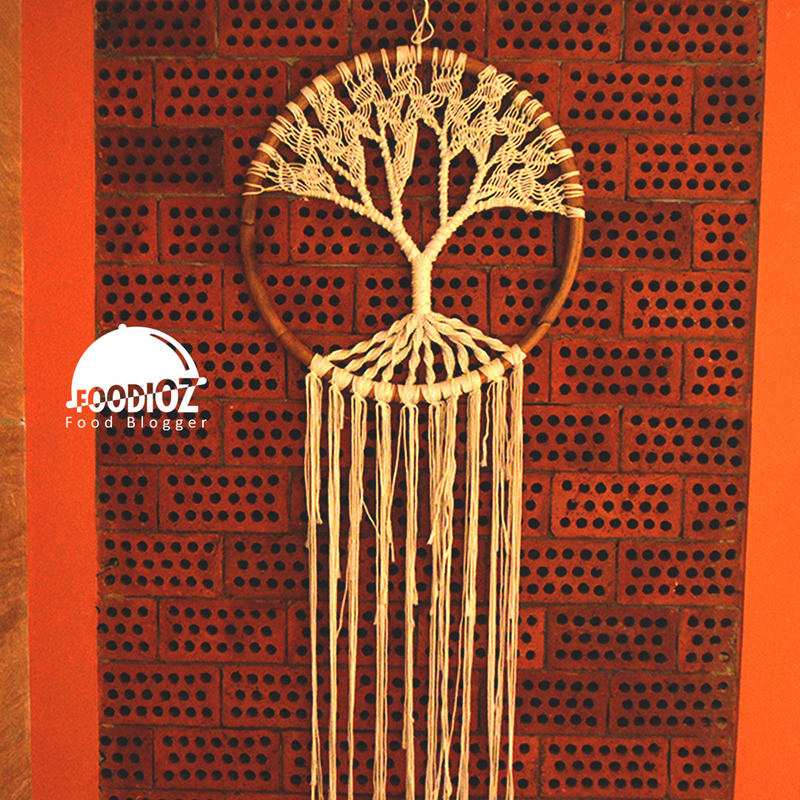 Then, with a vintage pattern on the wall, a touch of artworks such as paintings adorn several spots. With the concept of rustic unfinished ceiling, then there are plants in pots that are hung and interior kitchen station in the center so that allows us to see how the process of making food. This time I met with Icha, one of Belly Bandit's friendly team who welcomed my arrival. 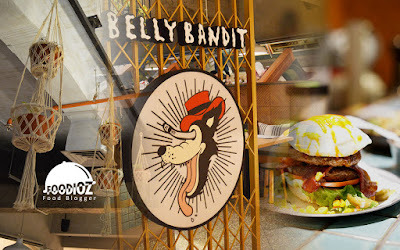 She explained the origin of Belly Bandit with the concept of comfort food, a comfortable place to provide an atmosphere to the customer if you're looking for a hangout spot or for lunch and dinner. 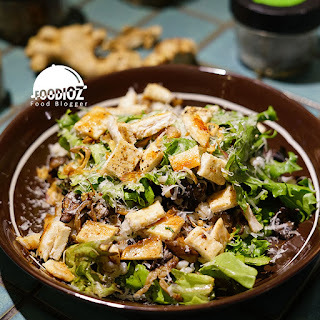 In addition, Belly Bandit also carries the concept of how to eat healthy by trying to make the best possible use of all quality ingredients without high sugar content. 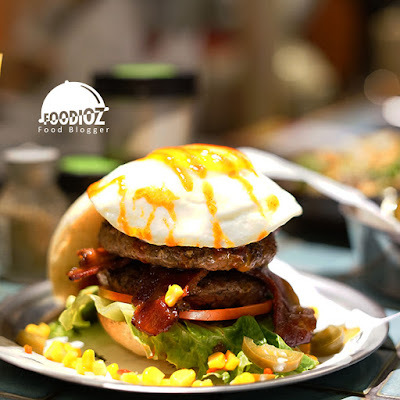 The main menu here is certainly a burger, with a variant that contains quite a variety of flavors and different ingredients ranging from the bun, patty, cheese, jam & salsa and also the sauce. In addition to one of the joyful things, we can order a burger with a choice of ingredients that we want as much as the theme of build your own burger. It took me a while to choose, because there were so many interesting choices and I thought about the good ones being photographed. Finally I chose a burger with english muffin bun, pickled jalapeno, fried egg, bacon, spicy corn relish, cheddar, and gojuchang sauce. With a sizable burger and a tall layer makes it all the more tempting and I couldn't not wait to eat it. The right way to enjoy this burger is by holding it one and eat directly with one bite from top to bottom layer, but since it is a big eat, so I tried to enjoy it per layer and slowly. Each element provides a different taste and when eaten together will provide a sensation that is very delicious. Another information, one burger is big enough and full for me. In addition to burgers, of course there is also another menu that is not less interesting. Starting from a fresh Roasted 'Shroom, a salad with 3 types of local mushrooms, pearl barley, arugula, parmesan, shallot and lemon vinaigrette. The dominant yet odorless mushroom flavor, combined with the textured barley pearls, and the fresh also acidic lemon sauce certainly make the appetite increase. 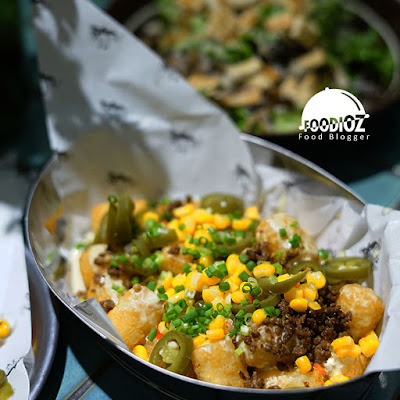 Then followed by Loaded Tots Bandito, tater tots with potato base served with minced meat, jalapeno, corn relish, green onion and melted cheese sauce. I highly recommend this menu, especially in this warm state can be a snack is so delicious. The texture of the crisp tots outside and soft inside, combined with the flavor of a legit cheese sauce and added with spicy jalapeno really rich in taste. Not to forget, we may also enjoy a fresh drink after a meal of course. 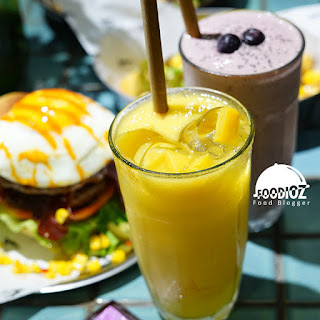 With choices of smoothies, milkshakes, coffee & tea or beer. 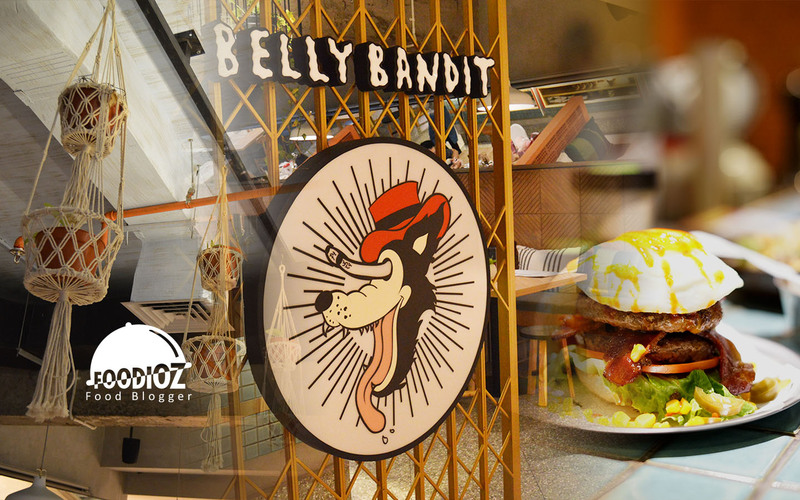 Belly Bandit certainly offer dining experience with varied comfort food menu, consistent taste, cozy restaurant atmosphere and also quite affordable price of course. I am sure will be back!